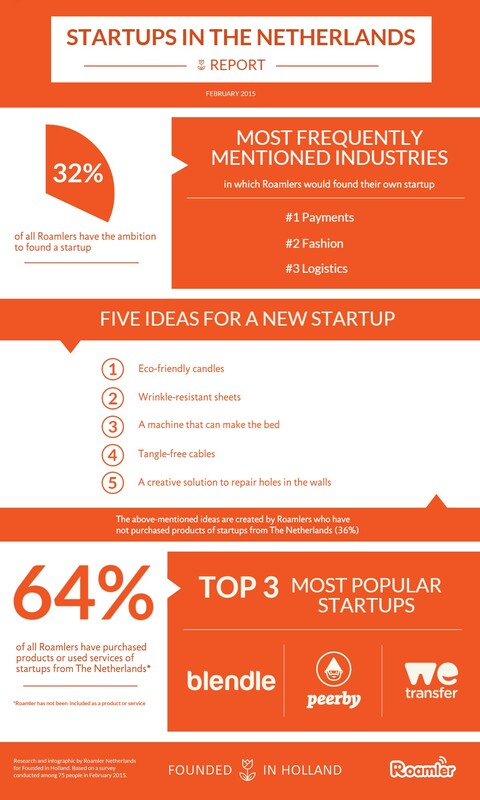 How startup-minded are we in the Netherlands? Founded in Holland is curious to see what the current ‘startup state of mind’ is in this beautiful country. We couldn’t think of a better way than to ask a startup to investigate this. Dutch crowdsourcing app Roamler put its well-trained mobile workforce (the Roamlers) to work for us. The results show that startups are definitely on people’s minds: 64% have used the products or services of Dutch startups. The most popular startups are the ‘Spotify for journalism’ Blendle, ‘local lending app’ Peerby and ‘funky Dutch cloud service’ Wetransfer. Not only do Roamlers use the products or services of startups, 32% of them have the ambition to become entrepreneurs themselves. Most frequently mentioned ideas for startups were in industries such as payments, fashion or logistics. Others who don’t have the ambition to start their own company, surely had a couple of ideas for new startups like wrinkle-resistant sheets and eco-friendly candles. And if you do, don’t forget to join Founded in Holland.